A brief overview of the history, physical characteristics and dominant traits of the beef cattle breeds common to Ontario follows. The breeds in this section have substantial numbers in both purebred and commercial operations and have undergone substantial selection programs over the years. The breeds listed offer the genetics and selection required to develop a breeding program suitable for the available market. Figure 1. An Angus bull. The Aberdeen Angus breed existed in Scotland 400 years ago and evolved during the 19th century in northeast Scotland in the counties of Angus and Aberdeen. The first Aberdeen Angus was imported into Canada in 1860. Angus cattle are solid black or red and are polled. Both colours are registered in the Canadian Angus Association herd book. 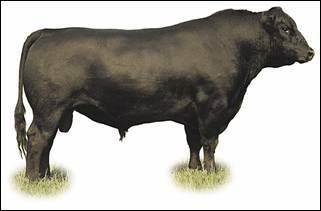 Angus are noted for good maternal qualities and a high carcass quality. Angus cattle are also recognized for their ability to forage under rugged conditions. 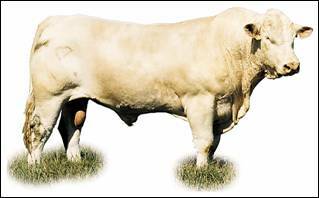 Blonde d’Aquitaine originated in the southwest of France, where they developed as a dual-purpose breed. Animals are cream to fawn coloured. The breed is horned and recognized primarily for its beef characteristics and high yielding carcasses. The first Blondes were introduced into Canada in 1971. Figure 2. The Blonde d’Aquitaine. Charolais, one of the oldest French breeds and the earliest European import into Canada, arrived from the U.S. in 1955 and from France in 1967. Originally, Charolais were used for meat, draft and milk, but have since become specialized as a beef breed. 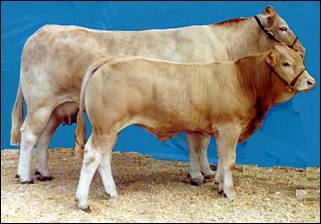 Cattle of the Charolais breed are large and heavy, white to cream-coloured and either horned or polled. 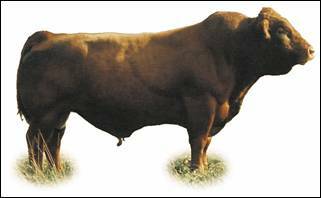 Through sire evaluation and breed improvement, they offer the beef industry hardy cattle with rapid growth and good muscling. Figure 3. A Charlolais bull. Gelbvieh or German Yellow Cattle evolved in the early 19th century through the crossing of various breeds in northern Bavaria. This produced a growthy dual-purpose animal that also served as a draft animal. Gelbvieh have been in Canada since 1972. Emphasis in North America in recent years has been on meat production. The Gelbvieh is solid-coloured, reddish gold to russet, with fine dense hair. They have good size, heavy muscling and are known for their desirable carcass and strong maternal characteristics. Figure 4. A Gelbvieh bull. 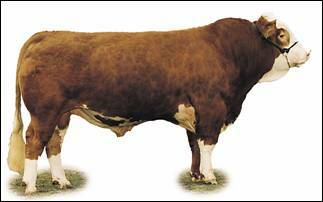 The Hereford, one of the oldest cattle breeds, was developed in Herefordshire, England. First importations into Canada were in 1860. 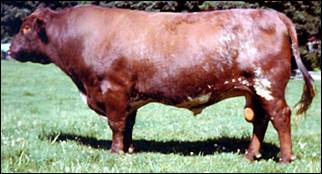 The Hereford is a reddish-brown colour with white on the head, brisket, chest, underpart of the body, lower legs and tassel. The white face is a dominant characteristic. Herefords can be either horned or polled. Hereford cattle are extremely hardy and show excellent foraging ability. Among beef breeds, they are not high milk producers but have good growth potential and calve relatively easily. Their popularity is shown by their continued use as a beef-producing animal that crosses well with other breeds. Bulls are usually docile and easy to handle. Figure 5. A Hereford bull. The Limousin originated in the hill country of south-central France. The cattle range from a golden wheat colour in the females to a deep red-gold in the males, darkening somewhat with maturity and age. The Limousin has always been selected for its meat qualities. 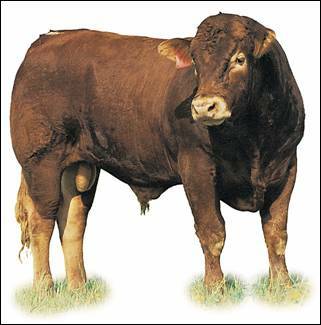 Referred to as the “carcass breed,” Limousins do well in carcass competitions with their large rib eyes and high yielding, quality, lean carcass. Cows are also noted for their calving ease and mothering ability. Limousins were introduced into Canada from France in late 1968. Figure 6. A Limousin bull. The Maine-Anjou is one of the largest breeds of cattle in France. They were developed in Brittany when stock that existed in the area before 1850 were crossed with imported Shorthorns to produce a superior animal. The breed is large, horned, and is dark red, usually with a white underline and often with small white patches on the body. The appeal of this breed to cattle producers is their high growth rate, milking ability and good disposition. Lean carcass quality and high cutability also put them in demand. The breed was first imported into Canada in 1968. Figure 7. A Maine-Anjou bull. The Shorthorn originated in the counties of Durham, Northumberland and York, England. First importations into Canada took place in 1825. The Shorthorn has been called the Foundation breed since it has been used in the development of 30 or more exotic breeds throughout the world. Shorthorns may be red, white, roan or any combination of red and white. Cattle are either horned or polled. The breed acquired a reputation for hardiness, mothering ability, and good temperament. The major development of the breed has been for beef production, although dual- purpose herds for milk production are being maintained. Figure 8. A Shorthorn bull. The Simmental originated in Switzerland during the Middle Ages. Although developed as a triple purpose meat/draft/milk animal, they are now considered a dual purpose milk and meat producer. 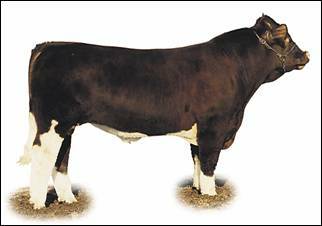 Simmentals range in colour from light tan to dark red with white markings on the head, behind the shoulders, belly, legs and flank. They can be horned or polled. 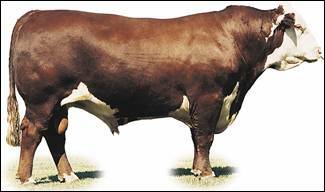 Simmentals are noted for their muscling, high growth rate and high milk production. Simmental cows usually wean heavy calves due to their high milk production and the breed’s high growth potential. First imports into North America were in 1967. Figure 9. A Simmental bull.